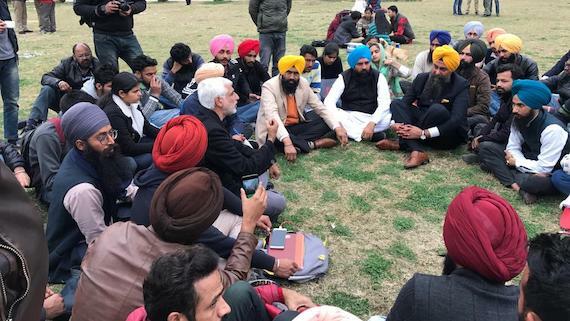 Chandigarh: Three Punjab MLAs, a senior lawyer of Punjab and Haryana High Court and various students of Panjab University Chandigarh took part in a discussion hosted by a students group called Sath. The discussion was held on Tuesday (Feb. 12) at a lawn near the library in PU. The topic of discussion was related to a recent court verdict in which 3 Sikh youths were sentenced to undergo imprisonment for life for allegedly waging war against the state by possession some historic photographs and printed books. Sukhminder Singh, one of the organisers and a representative of Sath, informed Sikh Siyasat News (SSN) that senior advocate Rajwinder Singh Bains, AAP MLAs Harkishan Singh Rori (Garhshankar), Kultar Singh Sandhwan (Kotkapura) and Kulwant Singh Pandori took part in this discussion. Advocate R. S. Bains, who was also one of the defence lawyers in the said case, stated that these three Sikh youths were convicted sections 121 and section 121A of Indian Penal Code for waging war whereas the fact is that no weapon was recovered from them. He said that the Nawanshehr session court judge sentenced trio, namely Arwinder Singh, Surjit Singh and Ranjeet Singh only on basis of few books, pamphlets and photographs. He maintained that the verdict was a big question mark on Indian judicial system. AAP MLA Jai Kishan Singh Rori said it was a tragedy that youth belonging to a community which is well wisher of whole humanity are caged behind the bars without any serious offences. 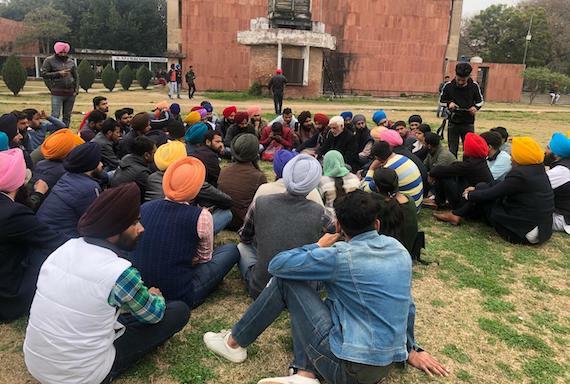 Sath member Sukhwinder Singh said that it was duty of the university students to raise voice against administrative violence and judicial encounters targeting minorities and downtrodden sections of the society. He said that the students should unite to build an mass movement against such tyrant actions of the state machinery.